Cited by the New York Concert Review as providing a “riveting and dynamic performance” at their 2013 Weill Recital Hall at Carnegie Hall concert, the acclaimed IRRERA BROTHERS DUO has captivated audiences throughout the United States and abroad, and have been hailed by the late world-renowned violinist and pedagogue Zvi Zeitlin as “two gifted boys.” Joseph and John have also performed at Lincoln Center for the Performing Arts, John F. Kennedy Center for the Performing Arts, Spivey Hall at Clayton State University, Rochester’s Kodak Hall at Eastman Theatre and internationally throughout Europe and Central America. The Irrera Brothers have released CD recordings, including “Beethoven & Prokofiev” (2012) and “Vitali” (2014), featuring Russell Scarbrough’s Bow Shock, written for them and premiered at Weill Recital Hall at Carnegie Hall in 2013. Currently, the duo is completing a multi-year recording project of the complete violin and piano works by Robert Morris, Professor of Music at the Eastman School of Music. To be included on the album is Drawn Onward - Fantasy for Violin and Piano, composed for the Irrera Brothers in 2014. Joseph, a Steinway Artist, is a laureate of several piano competitions, including the American Protégé (New York City), Eastman Young Artists, Guthman (Atlanta, GA) and Young Artists (Washington, DC) international piano competitions. He has performed as soloist with the Rochester Philharmonic Orchestra collaborating with conductors Christopher Seaman and Leonard Slatkin, as well as with the symphony orchestras of Georgia, Genesee and Penfield. Joseph recorded a CD of solo piano works of Chopin, Scarlatti and Schumann, soon to be released on the Steinway & Sons label. John is also a winner of many national and international music competitions. As a soloist, he has appeared with the Rochester Philharmonic Orchestra, Clayton State University Symphony Orchestra, Eastman Percussion Ensemble, Georgia Tech Chamber Orchestra, Metropolitan Youth Symphony Orchestra of Atlanta and Penfield Symphony. Notable collaborations include those with conductors Nicholas McGegan, Peter Oundjian and Michael Tilson Thomas and composer Tan Dun with the Metropolis Ensemble. Currently, John serves on the faculty of Clayton State University and Virginia Tech. As dedicated educators, Joseph and John Irrera have presented performances, masterclasses and lectures at Bridgewater College, Florida Southwestern State College, Kennesaw State University and Lee University, as well as workshops at the New York State Music Teachers Association Conference, Georgia Music Teachers Association and 2015 MTNA National Conference in Las Vegas, where they also served on the jury for that year’s MTNA Competition National Finals. The duo has accepted faculty positions to the 2017 Sessione Senese per la Musica e l’Arte, a summer music festival in Siena, Italy. 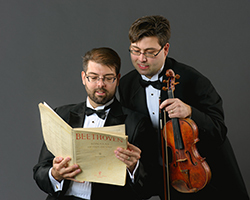 The Irrera Brothers are graduates of the Eastman School of Music, from which, in May of 2014, they became the first siblings in the institution’s distinguished history ever to graduate together, each with his Doctor of Music Arts degree. This program presents the music of composers celebrating significant anniversaries during the 2016-2017 season. Two brothers perform works of composers who also share a family connection. A true family affair! They are both very fine boys. To be able to get this privilege of playing at Carnegie Hall is very special and of course, I’m proud of them. They are two gifted boys. It is always interesting when talented soloists play together, but when they are siblings, there is an additional layer of interest. One would expect a connection between the players that would be hard to match. By and large, I found this to be the case. The Sonata for Violin and Piano, although ‘classical’ in form, is unmistakably Prokofiev with its humor, lyricism, and driving energy. The Irreras evidently have a special affinity for this work, as it was a riveting performance. It was the highlight of a very successful concert [at Weill Recital Hall, Carnegie Hall].